"We've had to do a lot of building work to get where we are. But we showed we're an improved side. Going into the last 10 minutes we could have won it. "It was a solid start. We got on top and took the game to them. We wanted to come here and score goals. "It was a perfect start. It was difficult to concede after we thought it was a foul. We saw Adam Marriott get fouled and obviously the overload from the counter attack that followed led to the goal. It's harsh, when you see a foul as blatant in my eyes and the players' eyes as that it's hard to accept it, for sure." Match ends, Shrewsbury Town 3, Stevenage 2. Second Half ends, Shrewsbury Town 3, Stevenage 2. Attempt missed. Jean-Louis Akpa-Akpro (Shrewsbury Town) right footed shot from the right side of the box is close, but misses to the left. Substitution, Stevenage. Calvin Zola replaces Dean Wells. Substitution, Stevenage. Chris Beardsley replaces David McAllister. Substitution, Shrewsbury Town. Jermaine Grandison replaces Cameron Gayle. Substitution, Shrewsbury Town. Keith Southern replaces Ryan Woods. Goal! 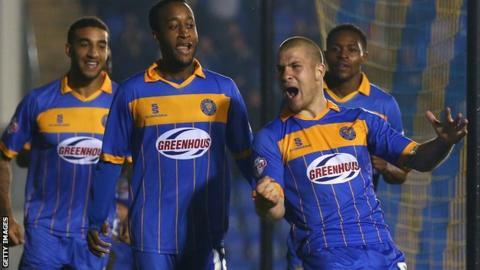 Shrewsbury Town 3, Stevenage 2. James Collins (Shrewsbury Town) left footed shot from the left side of the box to the centre of the goal. Assisted by Mickey Demetriou. Hand ball by Jean-Louis Akpa-Akpro (Shrewsbury Town). Attempt saved. Dean Parrett (Stevenage) right footed shot from outside the box is saved in the top left corner. Attempt saved. Liam Lawrence (Shrewsbury Town) right footed shot from outside the box is saved in the bottom left corner. Corner, Stevenage. Conceded by Cameron Gayle. Dean Wells (Stevenage) hits the bar with a right footed shot from the centre of the box. Corner, Stevenage. Conceded by Jayson Leutwiler. Attempt saved. Adam Marriott (Stevenage) right footed shot from the centre of the box is saved in the bottom right corner. Bobby Grant (Shrewsbury Town) wins a free kick in the attacking half. Attempt saved. Jean-Louis Akpa-Akpro (Shrewsbury Town) right footed shot from the centre of the box is saved in the bottom left corner. Attempt saved. Mickey Demetriou (Shrewsbury Town) header from the centre of the box is saved in the top centre of the goal. Corner, Shrewsbury Town. Conceded by Jerome Okimo. Attempt missed. Chris Whelpdale (Stevenage) right footed shot from outside the box is close, but misses to the left.